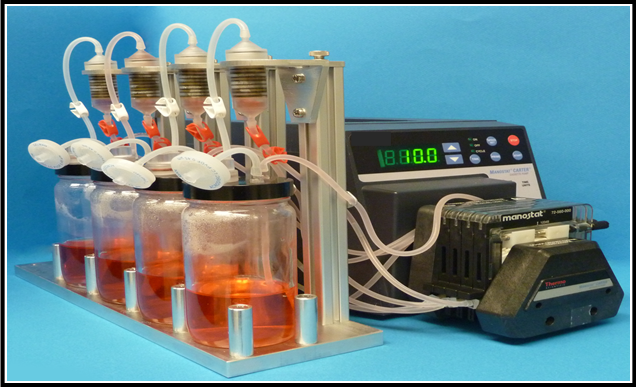 A Novel 3D Perfusion Bioreactor From 3D Biotek! Numerous studies have proven that cells grow better under dynamic culture condition, simply because both nutrition supply and metabolic waste removal are better under dynamic culture conditions. Additionally, in some instances, the shear force produced by the flowing medium can act as a mechanical stimuli signal that will further promote stem cell differentiation toward certain cell lineage, such as osteoblast. Combined with our proven 3D InsertTM scaffold technology, we are very pleased to announce that we have launched a novel 3D Perfusion Bioreactor. The bioreactor consists of multiple independent, autoclavable polycarbonate chambers (4 chambers as shown in the picture). The chambers are interchangeable and are specially designed to take the advantage of 3D InsertTM scaffolds with various sizes ranging from 96-well to 6-well. 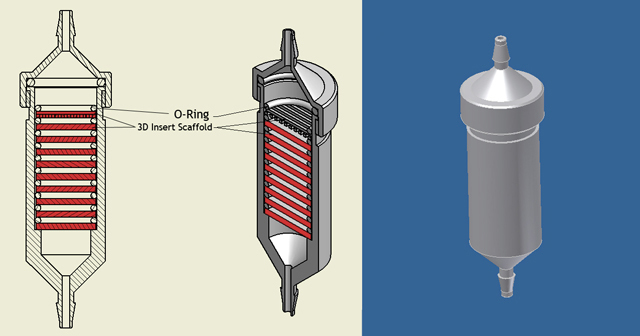 Cell culture medias are perfused through the open porous structure of scaffolds using a pulsatile pump. The entire unit is autoclavable (except pump, of course) and can be used as a single-use bioreactor system. 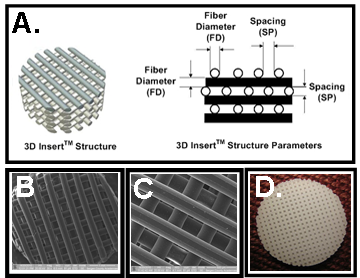 Porous polymer scaffolds were engineered using 3D Biotek’s Proprietary Precision Microfabrication Technology. These scaffolds are available in both biodegradable (polycaprolactone, PCL) (Figure A). and non-biodegradable (polystyrene, PS) polymers. Struts of each layer of the scaffolds are oriented 90° relative to the struts of the layer immediately below (Figures B-C, scanning electron micrographs). Not only that 3D InsertTM will provide a 3D cell culture environment, but also will provide a significantly greater total cell growth area than that of a traditional 2D tissue culture well.